From September 5 – September 9, 2010, the International Association of Law Libraries hosted its 29th Annual Course on International Legal Information and Law entitled “Dutch Gateways to International Law” at The Hague, The Netherlands. The meeting took place at the Peace Palace, where I joined approximately 200 librarians, attorneys, and professors in attendance from around the world. The course is designed to provide international researchers with a clear understanding of the wider legal environment in which we operate. In addition to presenting attendees with a review the legal system of the host country, the conference also featured several sessions in international law, including an assessment of the ongoing role of The Hague Conference on Private International Law, a review of recent cases at the International Court of Justice and the Permanent Court of Arbitration, and presentations from various distinguished speakers regarding international criminal law, water law, law of the sea, maritime, harbor and transport law, air law, and The Hague Convention on the Protection of Cultural Property, among many other topics. 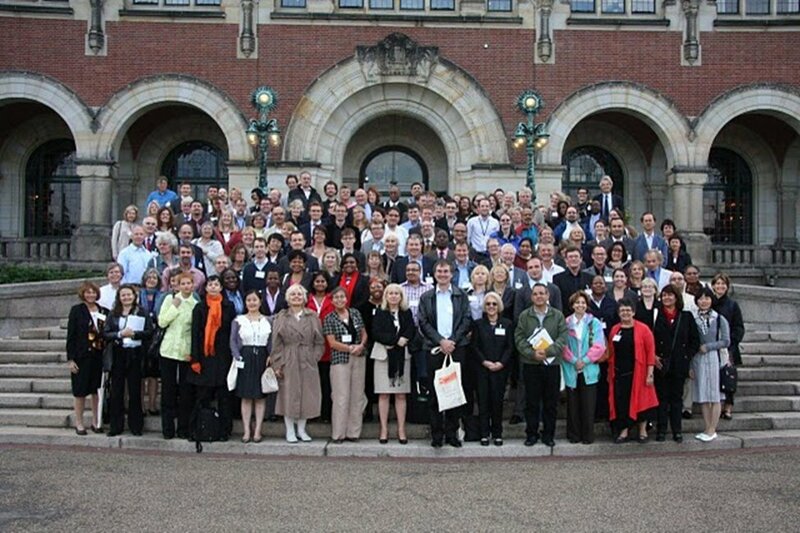 Image: IALL Annual Meeting attendees in front of the Peace Palace, The Hague, Netherlands.